Bringing treatments out of laboratories and into clinics remains a major obstacle for healthcare. Mice and other common lab animals cannot reliably predict human responses to the same treatment. Using human stem cells sourced directly from patients, NYSCF overcomes that translational obstacle. The Wall Street Journal’s article, “Stem Cells Help Evaluate Experimental Alzheimer’s Drugs” cites NYSCF CEO Susan L. Solomon laying out the path towards the future of disease modeling and treatment testing directly in patients’ cells. 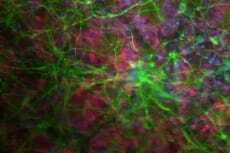 Specifically for evaluating new, experimental treatments to Alzheimer’s, a leading cause of dementia, stem cells generated from patient samples can be turned into brain cells to afford scientists the capacity to look at patients’ neurons without disrupting patients’ lives. The WSJ article also notes a paper featured in The Lancet co-authored by scientific advisor to NYSCF Mahendra Rao on the necessity of accelerating stem cell trials for Alzheimer’s disease.